Built to thrill, the 2016 Chevrolet SS is one car that'll rock your world and make you remember exactly what driving passion feels like. Every 2016 Chevy SS review we've seen so far reflects excitement about the car's new changes, which help improve aerodynamics and deliver updates in styling and features. When you come test drive the 2016 Chevy SS in Phoenix, Arizona, make sure to take a good look at its revised front fascia. There you'll see a new grille, LED lights and added vents on the hood, which aren't just there for show, but actually contribute to improving driving dynamics. Vertical ducts have been integrated into the car's design as well and they assist in moving air around the front wheel arches, further aiding aerodynamics. Also new on the 2016 SS, a red paint hue now covers the Brembo brakes and a dual-mode exhaust has been added, which produces an even more robust sound at higher revs, while offering a quieter sound when drivers are traveling at lower speeds. Where the rubber meets the streets, the sedan's new 19-inch cast-aluminum wheels flaunt a machined-face finish; an update that 2016 Chevy SS reviews call an eye-catching touch. So, what hasn't changed this year? For starters, the SS keeps its acclaimed 6.2-liter, 415-horsepower V-8 engine and transmission options (six-speed manual and six-speed automatic with paddle shifters). The sports sedan also continues to offer a full suite of convenience features, including standard heated and ventilated front seats, Bluetooth Hands-Free Phone and Audio Streaming, a rearview camera, navigation, and the Chevy MyLink infotainment unit with easy-to-use touch controls and Siri Eyes Free, among other appealing amenities. Advanced safety features are also thrown in the pot of standard features, too. Along with all the basic security features you could ask for, technologies like forward collision alert, blind-spot monitoring, lane-departure warning and automated parallel parking are all standard on every 2016 Chevy SS in Phoenix! 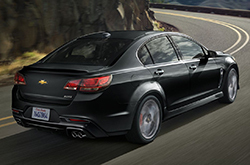 Stop by today and take the 2016 Chevy SS for a test drive! When you compare Chevrolet's new 2016 SS against the 2016 Ford Mustang, Nissan GT-R and Dodge Challenger, we're sure you'll find out that the SS is perfectly built for you. You'll be thankful for the SS model's long list of appealing attributes, including its cut-rate pricing and modern cabin amenities. Compare its price to the vehicles listed above and you'll see that it's a truly outstanding value, which is one of the main reasons why so many Phoenix drivers select it. Check out our facts list to learn more about the SS - bullets below this paragraph. 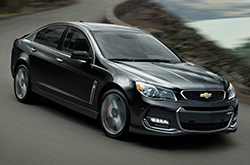 2016 Chevrolet SS Colors: Silver Ice Metallic, Slipstream Blue, Red Hot 2, etc. We've taken the time to create reviews about vehicles like the 2016 Chevrolet SS because we know how important it is to your car search. Good reviews are hard to find, but as a respected Chevrolet franchise in Phoenix we've put it all in one location for you. Each section is overloaded with important material, including info about cargo capacity and more - everything you need to make a smart purchasing decision. Is the SS not the right model for you? 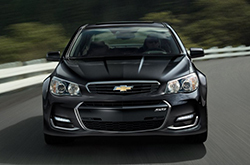 Discover more about other vehicles on sale at Midway Chevrolet using our reviews index. With it you can review and compare Chevrolet's entire line of vehicles.